After reading all of the negative reviews on The Peculiars I wasn’t expecting that much. I was happily surprised that although the book is rather slow-paced, the setting was definitely worth it. Lena’s dad was a goblin, a Peculiar. Now the government has decided that all Peculiars have to be sent to work in mines in Scree, a inhospitable and wild land. She has the strange triple-jointed hands and large feet that point to goblinism, and she is scared she has also inherited her father’s wickedness. When she turns eighteen and receives a letter of her father, she decides to go to Scree to find him. I think the blurb of The Peculiars is very misleading. It boasts a thrilling adventure, but to be honest the adventure part of this book is very little. 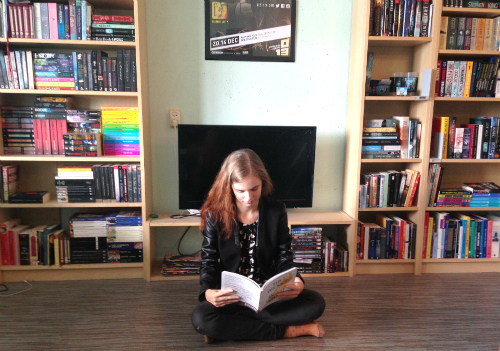 It’s mostly about Lena’s insecurity about her identity and how to live with the stigma of being different. Big parts of the story are spent in libraries, in coaches and in tearooms. It reminds me of the slow but dark gait of Victorian fiction. 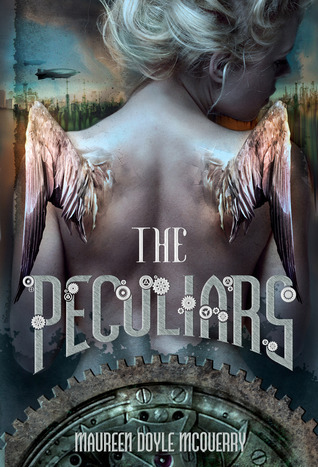 The steampunk aspect of the book is rather light – I think you could better classify The Peculiars as alternate history. There are some nifty inventions, but since Lena herself doesn’t really have an interest in them, they are only in the background. I was very interested in the mythology behind the Peculiars, but this book didn’t answer all of my questions. I hope we learn more about them in the next book. Or isn’t there going to be one? I can’t find information on this being a series or not, but if it’s a standalone I’m going to be very disappointed. Even though the main character Lena is rather whiny, I very much enjoyed the story because of an interesting cast of secondary characters and the overall mood. Ms McQuerry does dark and foreboding very well, and that was mostly what kept me reading. I would like to read more about this world and find out which kind of Peculiars there are and how they came to be. This dark and thrilling adventure, with an unforgettable heroine, will captivate fans of steampunk, fantasy, and romance. On her 18th birthday, Lena Mattacascar decides to search for her father, who disappeared into the northern wilderness of Scree when Lena was young. Scree is inhabited by Peculiars, people whose unusual characteristics make them unacceptable to modern society. Lena wonders if her father is the source of her own extraordinary characteristics and if she, too, is Peculiar. On the train she meets a young librarian, Jimson Quiggley, who is traveling to a town on the edge of Scree to work in the home and library of the inventor Mr. Beasley. The train is stopped by men being chased by the handsome young marshal Thomas Saltre. When Saltre learns who Lena’s father is, he convinces her to spy on Mr. Beasley and the strange folk who disappear into his home, Zephyr House. A daring escape in an aerocopter leads Lena into the wilds of Scree to confront her deepest fears.